Construction has begun on multi-million pound Lindores Abbey distillery in Fife following a lengthy excavation of the site, with production due to commence in September 2017. 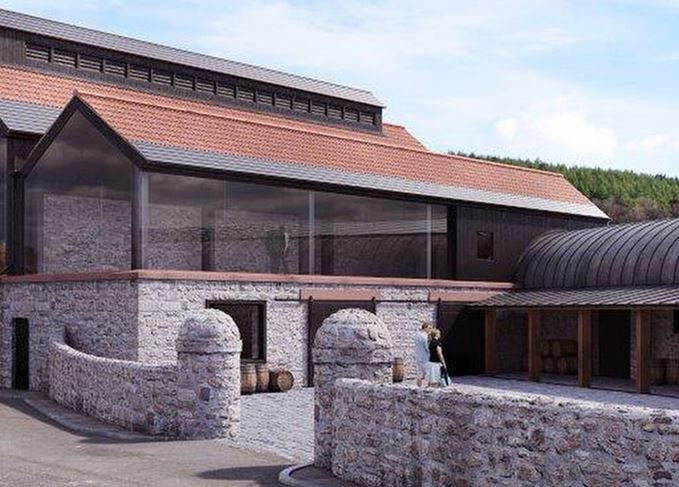 Planning permission for the distillery was granted in 2013, but one of the conditions required founder and managing director Drew McKenzie Smith to dig trenches around the site, which he said had never been properly excavated. The first trench uncovered an 18-metre abbey wall just five inches below the earth’s surface, though the following 17 trenches revealed no further artefacts. ‘This was a hugely important find that had been sitting there undiscovered,’ McKenzie Smith said. ‘We are hoping to leave this particular trench uncovered so visitors will be able to see it when they come to the distillery. Lindores Abbey distillery is located opposite the derelict Lindores Abbey, which is often referred to as the ‘spiritual home of Scotch whisky’. According to the Exchequer Rolls, Friar John Cor, who is believed to have resided at the abbey, was ordered by King James IV to ‘make aqua vitae eight bolls of malt’ in 1494 – the first written evidence of whisky distillation in Scotland. Building of the distillery commenced two weeks ago and is expected to last for 14 months. It will feature three copper pot stills, including one wash still and two spirit stills. Barley will be grown on the farm land surrounding the distillery, which boasts approximately 60 acres, though McKenzie-Smith has not ruled out sourcing additional barley supplies from other farms if needed. An onsite warehouse will have room to house up to 1,000 casks with partly heated sections to allow Dr Jim Swan – who is working with McKenzie Smith as a whisky consultant – to experiment with maturation. McKenzie Smith and Dr Swan are currently in the process of sourcing casks, with McKenzie Smith recently travelling to Louisville to explore the possibility of using Bourbon barrels from Woodford Reserve. The team is also looking to source Sherry casks from Spain. ‘I believe our warehouse will be the first of its kind in Scotland,’ added McKenzie-Smith. ‘Experimenting with speed and spirit maturation is the world we live in, but we promised Jim we won’t release the whisky until it’s ready. ‘If it can be done in five years rather than 10, then that’s no bad thing. But we don’t want to do anything to harm the spirit; we’re not about rushing or making anything gimmicky. If building and production goes according to plan, McKenzie Smith said the first Lindores Abbey single malt Scotch whisky could be ready for release by 2023. He also hinted at the possibility of bringing out a peated expression in a nod to when monks were given permission to bring 200 carts of peat to the abbey 600 years ago. In addition, a special bottling may also be created using a specific yeast strain that has been researched at Heriot-Watt University, and could have been used by Friar John. While he waits for the whisky to mature, McKenzie Smith plans on launching an unaged ‘aqua vitae’ in September 2017. The ‘ultimate whisky troubleshooter’, he lent his expertise to distilleries all over the world. The Fife distillery has launched seven single cask single malts with various mash bills.